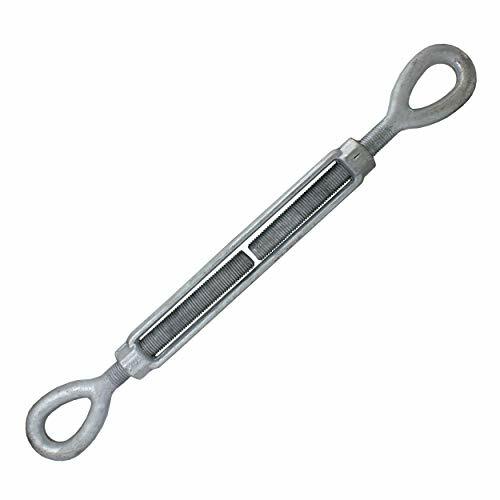 Marine Part Depot Stainless Steel Turnbuckle Jaw/Jaw 3/16"
Marine Part Depot Stainless Steel Turnbuckle Jaw/Jaw 1/4"
National Hardware N222-026 2174 Hook/Hook Turnbuckles in Zinc, 3/8" x 10-1/2"
Stainless Steel Closed Body Turnbuckle Jaw/Jaw with T Toggle 5/16"
Stainless Steel Turnbuckle Jaw/Jaw 3/16"
This is for two (2) quality marine grade stainless steel (AISI 316) 5/16" UNC turnbuckles with hook and eye. Each turnbuckle is stamped with the grade of 316 and the size of 5/16". Each turnbuckle comes with a locking nut on each end. 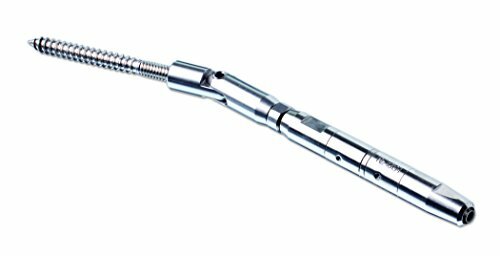 This turnbuckle is designed to adjust tension or length in rope, cables or other tensioning systems. Not to be used for overhead lifting. AISI 316 stainless is a premium grade of stainless and is considered by many to be best in class. 316 stainless is corrosion resistant and very durable even in the harshest of conditions. Breaking Load 650lbs. 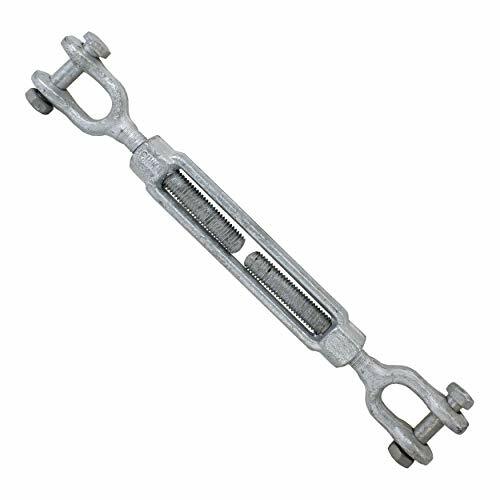 Stainless Steel Turnbuckle Jaw/Jaw 1/4"
Whether for home, farm, builder or industrial customers, National has all the right hardware in the sizes and finishes you need. With over a century of service National is committed to maintaining the highest level of product quality, innovation and manufacturing technology. Providing latching and fastening options for all of your indoor and outdoor uses. Barrel, Dutch door, flush, mortise and surface bolts designed with ease of use and security in mind. Zinc plating offers corrosion resistance for all of your functional hardware needs. 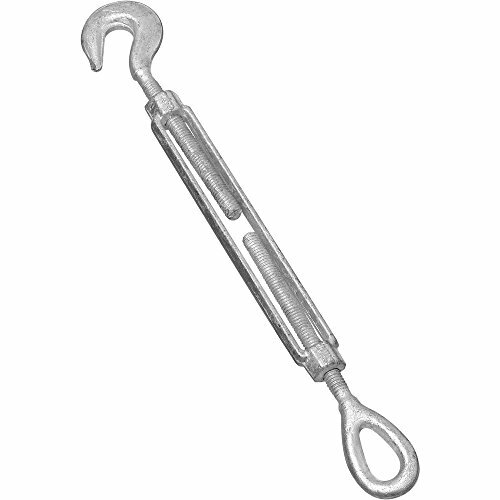 Stainless Steel Closed Body Turnbuckle Jaw/Jaw with "T" Toggle 5/16"
Whether for home, farm, builder or industrial customers, National has all the right hardware in the sizes and finishes you need. With over a century of service National is committed to maintaining the highest level of product quality, innovation and manufacturing technology. Providing latching and fastening options for all of your indoor and outdoor uses. Barrel, Dutch door, flush, mortise and surface bolts designed with ease of use and security in mind. This galvanized finish offers corrosion resistance for products used where corrosive elements, such as salt air, are present. 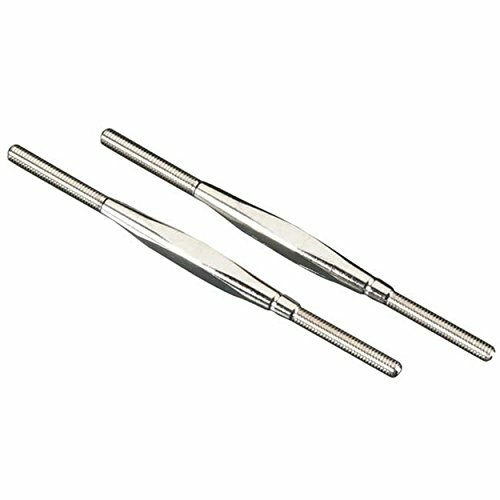 This is for one (1) quality marine grade stainless steel (AISI 316) turnbuckle (or open body) eye and eye with locknuts. Each turnbuckle is stamped both 12 the metric size and 316 the grade. This is an M12 metric turnbuckle. The imperial equivalent is generally considered to be 1/2". Not to be used for overhead lifting. AISI 316 stainless is a premium grade of stainless and is considered by many to be best in class. 316 stainless is corrosion resistant and very durable even in the harshest of conditions. 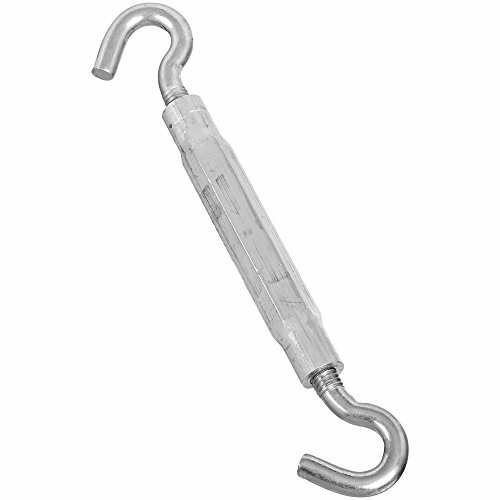 US Cargo Control Jaw and Jaw Turnbuckles are hot dip galvanized for durability and weather resistance. Our heavy duty turnbuckles are made for in-line or straight pull applications only. 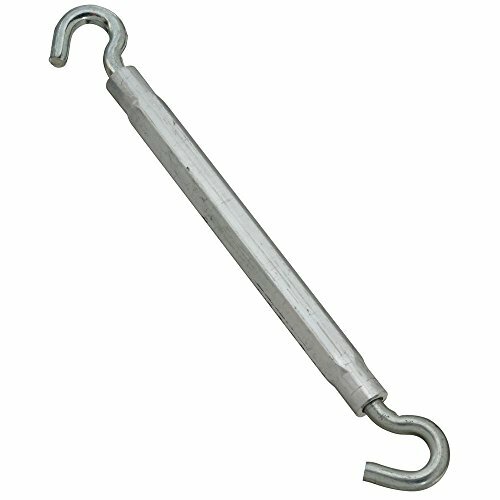 This galvanized turnbuckle featurea a jaw on each end which is fitted with a nut and bolt or pin and cotter pin assembly. Turnbuckles are measured by the diameter of the bolt and the length of the opening of the turnbuckle body. The overall length of this turnbuckle will be longer than the stated length, as that only pertains to the opening of the turnbuckle body. This turnbuckle is designed to ASTM F1145 specifications. US Cargo Control eye and eye turnbuckles are hot dip galvanized for durability and weather resistance. Our heavy duty turnbuckles are made for in-line or straight pull applications only. 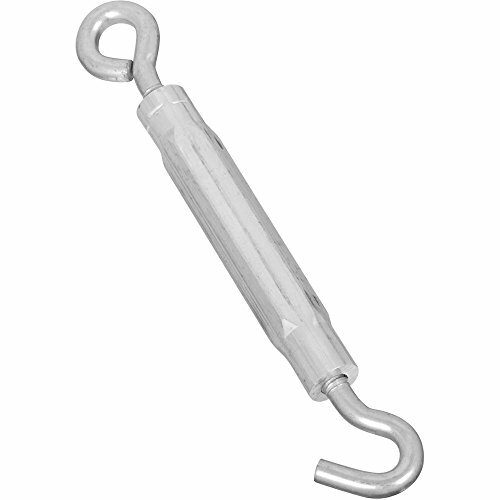 This galvanized turnbuckle features elongated eyes to maximize ease of attachment and minimize stress on the eyes. Turnbuckles are measured by the diameter of the bolt and the length of the opening of the turnbuckle body. The overall length of this turnbuckle will be longer than the stated length, as that only pertains to the opening of the turnbuckle body. 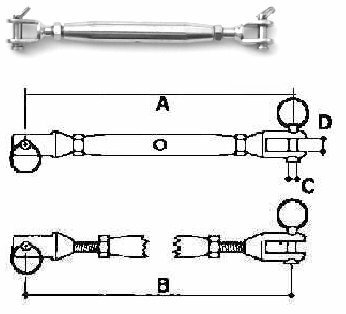 This turnbuckle is designed to ASTM F1145 specifications. Feeney 9916-PKG Quick Connect Pivot Swivel Turnbuckle, 1/8"
Quick-Connect cable hardware offers simplicity, speed and power with no crimping tools or wedge-type compression fittings. Suitable for use with all types of swaging machines, Sta-Lok's swage terminals are available in a wide range of styles to suit most applications. Manufactured from 316 stainless steel grade1.4401. All swage terminals are machined to close tolerances, to ensure accurate termination. Designed to suit most backing plates. Supplied with a highly polished finish. Sizes 5/32 to 3/8 available. Authorized Replacement for Stanley Hardware Stock #N221-846. Designed for tightening or drawing together various lines and cables. Hex body allows for ease of adjustment by hand or with a wrench. Steel wire hook on one end, eye on the other end. Extruded aluminum body. Mint craft Zinc Hook/Eye Turnbuckle. 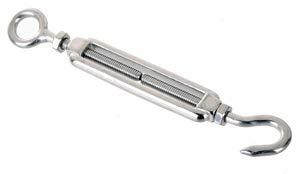 The turnbuckle features a hook on one end and a stainless steel wire eye on the other. Made from an aluminum body and is zinc plated. Measures 3/8" diameter and a length of 15". 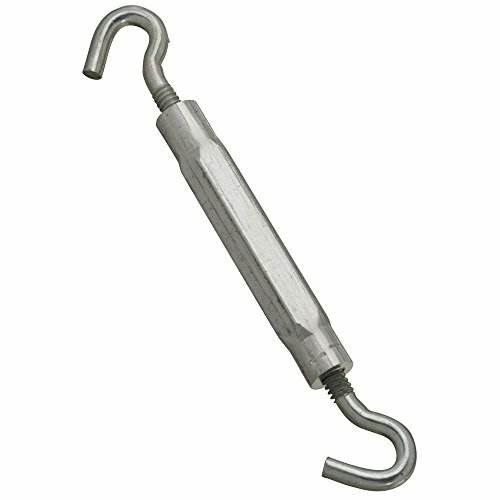 Stainless Steel Turnbuckle Jaw/Jaw 5/16"
TEMCo's turnbuckle in the open body style offers a strong, durable, and corrosion-resistant 316 stainless steel capable of withstanding thousands of pounds of force. When used as standing rigging on a sailboat, the open body style allows for a visual inspection before you go offshore, even for a short passage. It also allows for easy application of your favorite lubricant to ensure your rigging stays tuned and lasts for many passages and years. Our turnbuckle comes in a 5/16" thread diameter (marked on the turnbuckle) and a 8.61" body length. The entire turnbuckle, including its 0.24" 316 stainless steel clevis pin on both jaw ends, are capable of handling a Min Breaking force, or working load limit, of 3100lbs. Safe working load depends on application, and even orientation of the shackle under load. Our turnbuckles are also marked "316" to indicate the stainless steel type, as well as "L" and "R" to conveniently indicate which direction the body must be rotated to tighten the turnbuckle screws. These markings will also allow a consistent installation of stays on your sailboat so that turnbuckles will always tighten and loosen when turned in the same direction of your choosing. Jaw ends allow for easy yet secure connections. Strong design allows a minimum breaking load, or working load limit, of 3100lbs. Safe working load depends on application, and even orientation of the shackle under load. Open body style for frequent and easy inspections. Made out of precision cast 316 stainless steel. Stainless steel construction allows for superior strength and corrosion resistance. 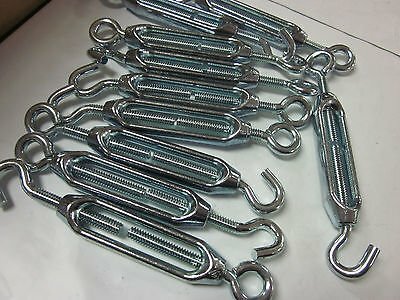 Stainless Steel Closed Body Turnbuckle Jaw/Jaw with “T” Toggle 5/16"